Note: When purchased, you will download a pdf document with links to access and make a copy of the 8 sessions included. After purchasing the printed materials from the publisher, this supplement helps the planning and implementation of this unit. This cannot be effectively used without first purchasing the printed materials from the publisher. 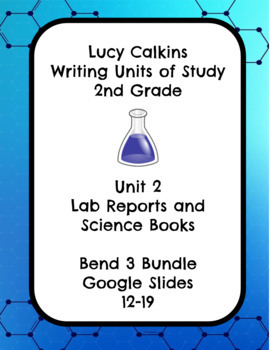 Second Grade Writing- Lab Reports and Science Books- 8 sessions - This resource was created in Google Slides. This bend of the unit covers writing about forces and motion in Informational Books. 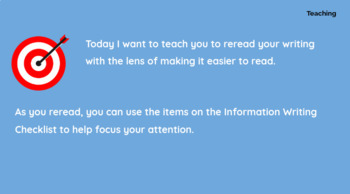 NOTE: This unit follows the Art of Information Reading unit written by Lucy Calkins and the Teachers College Reading and Writing Project (TCRWP). 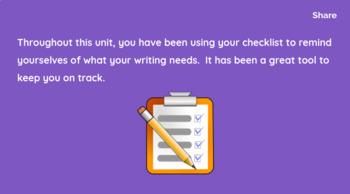 NOTE: While this unit is “ready to teach”, it cannot be taught without first purchasing the unit and utilizing its extensive notes, essays, and digital resources. It is meant to be a supplement to - not a replacement for - Lucy’s unit. In developing this unit for my classroom, I wanted something that I could use that would give a visual representation of Lucy’s lessons, be easy enough that a sub could teach it, and give my hearing-impaired and visual learners a way to learn. NOTE: The preview file and thumbnails only represent a few of the slides from one of the sessions. Each session has the full range of slides. These are only meant to show you the quality of the product you will purchase. This is the Bend 2 bundle of all the Google Slide presentations - from Lesson 12 through Lesson 19 (see below). The lessons follow the Workshop structure of Connection, Teaching Point, Teaching, Active Engagement, Link,Mid-Workshop Teaching and Share. Each of these sections has a different background color and are identified on most slides in the upper right portion of the slide. Because many of the components are visual and the verbiage is written on the screen, this is ideal for classrooms with hearing impaired or deaf students. Interpreters will be grateful because they can point to the words and get a break from signing. 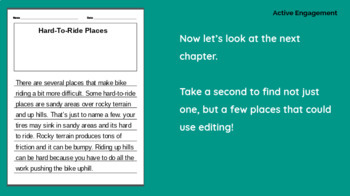 NOTE: The preview and thumbnails are just a FEW slides from one session of this unit, but all the files follow the same format with Connection, Teaching, Active Engagement, Link, MidWorkshop Teaching Point, and Share.